Wedding planning can be a fun, exciting and challenging career. Successful wedding planning requires the ability to visualize, planning extensively and in great detail, coordinating and following up carefully and meticulously. Planning for an event, such as a wedding, birthday, corporate event, fair, graduation party or any other special occasion, can be done with ease without getting stressed or intimidated. The key to planning for a successful wedding lies in making an early start, making a well thought out , detailed plan and being extremely organized. Although it is true that each wedding is unique, it is also true that the same fundamental rules of planning apply to all events regardless of the occasion. By adhering to these basic rules, you can ensure that the planning process is simple, stress free and guarantee the success of the particular wedding. Develop a Budget - Get a realistic and an exact figure of how much you are allowed or willing to spend. After you have done this, try and stay within this budget as far as possible. You should have an extra amount set aside for unplanned expenses as sometimes things may not work out as envisaged. In case your event requires a bigger budget than planned, then you could look into alternate sources of income that can be utilized. This may include selling tickets, getting corporate sponsors or getting donations. If this is not possible, then it is better to cut costs as much as possible and stick to the budget. Create a Timeline - Create a timeline or agenda for the wedding. Visualize everything that the wedding requires to be successful and pen down your vision, thus creating a detailed agenda. If the event is on a large scale and there is a committee involved, make sure all the members of the committee are involved in creating the timeline and brainstorming session. The time line will depend on the specific occasion or event. After deciding on what activities are required, you should specify the time and duration of each activity in a detailed agenda. Select the Right Wedding Planner- Make a list of items and services that can be outsourced from wedding planner and the cost of each. It could be food, giveaways, decorations, beverages, photographers, table setting, banners or entertainment. 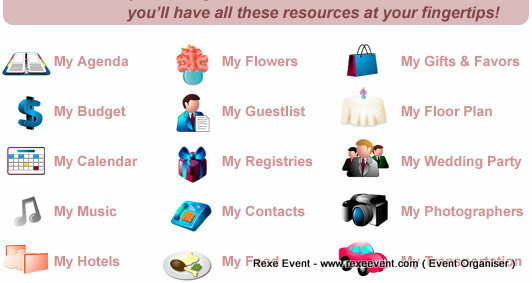 For each item or service on your list, get quotations from at least two to three wedding planners and then calculate your expenses. If they exceed your budget, then you can reduce or cut down on unnecessary expenses. Usually it is not advisable to cut down on expenses on entertainment as it is important for wedding planning. Some of the basic tenets of wedding planning are developing a budget, creating a detailed timeline and deciding on what items and services can be outsourced at the best possible prices. Thus wedding can be successfully executed and managed with proper planning and organation. You can avoid major malfunctions if you stick to the basic guidelines of wedding planner.